Never before, have so many depended so heavily upon innuendo, double entendre and verbal camouflage to express, then secondarily to cover up their audacious lies. The only aspect more repugnant than these preposterous acts of repetitious weaving is the speaker who begins to imagine his or her own vacuous fabrications piqued enough to be veracious. In the past this “spinning” activity was known as double-speak and prior to that simply, doubletalk. 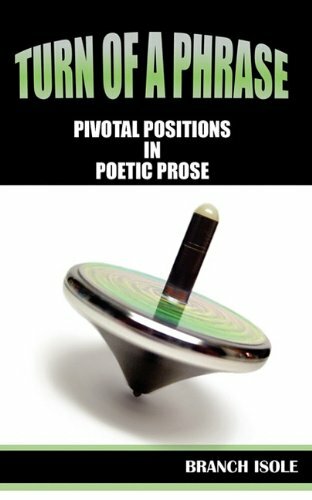 Leaping back further still we find such oratory described more poetically as the “Turn Of A Phrase.” Whereby the speaker either eloquently or by wit and mastery of the language, profusely and proficiently moved or ‘spun’ the topic on its axis. Thus guiding the emphasis and direction from one pivotal position to a different point altogether. In this way changing both the complexion and outcome of the discussion. May these short stories of poetic prose turn upon their phraseology axis’ to reveal slivers of recognition and identity for you. Turn of A Phrase, by Branch Isole, is a collection of poetry and at the same time a story. Unlike the majority of poetry books I’ve read, which I admit isn’t a great number; you can see there is a cadence to it that isn’t confined to each poem. This cadence is in each poem and between them, connecting them in such a way that you see a path, almost a journey to their rhythm. Normally when I read poetry I read it in bits and pieces because it’s a collection, but this time I read it from cover to cover as if reading any other fiction novel and when opting to see it as a collection rather than as each individual poem, it really does come across as a story from someone’s perspectives and observations on life and what is around them. You can read it as one piece and you can also read it as individual pieces. Each poem will bring about a different reaction; for me 21st Century Community made me think and want to question, Aquarium helped me to appreciate how the supposedly ordinary can have deeper meanings, Millennium Foreplay Thought Balloon made me laugh even though it was very short and I know that it may offend some people. There’s a wide range there, from poems filling several pages with thought to poems that are abrupt and succinct. I can be pretty picky with poetry, but I do enjoy it occasionally, and even though there are some religious topics present in Turn of A Phrase, I still found it engaging, entertaining, and thought provoking.